The way individuals socialize in a given environment has been described by Bourdieu, introducing the definition of “habitus” as a system of “governed provisions”. According to Bourdieu, a social capital acquisition by members belonging to the same social group leads to a social class habitus, encompassing the same values. Can this apply to homeless people? Will their habitus be endangered by their vulnerability? An article published by Pedro Estêvão & Al (1) cleverly underlines that individuals, even the poorest, develop an active relationship … with their conditions of existence, a “lifestyle” which varies according to these conditions … and “ways of life” which reflect internalized dispositions and preferences. The introduction of “homeless habitus” challenges the way we see resilience being the opposite of vulnerability. L. Chelleri & Al. (2), show that a particular attention needs to be paid to such opposition. This publication describes two different groups of residents living in slums in Kampala, Uganda, showing that the different habitus of each group translates into a low level of adaptive capacity for those having strong social networks, compared to those having little social cohesion but showing a higher level of adaptability. There is no need to travel far to find situations challenging our perception of social cohesion. 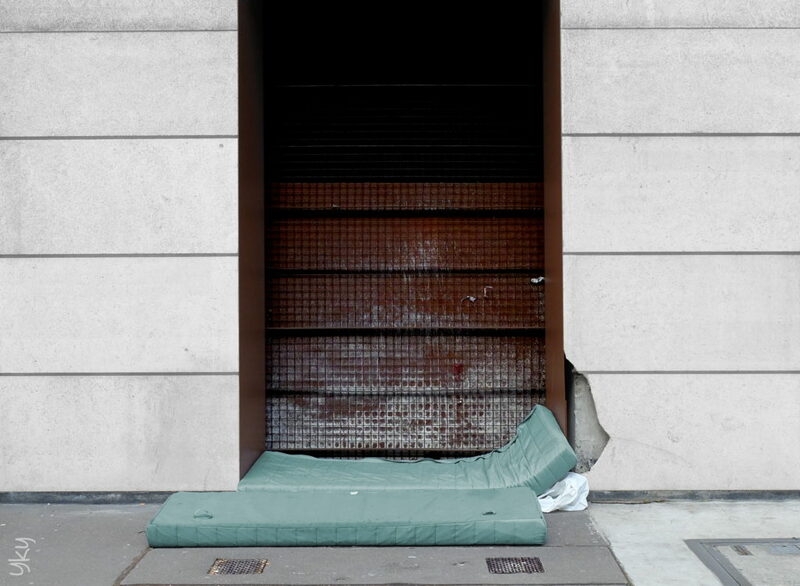 Sociologists E. Gardella and A. Arnaud, in a report on homeless people in Paris (3), detail the mechanism leading to settle in places that are not foreseen for living. In such cases, it appears that homeless people may refuse social accommodations preferring to stay in the public place, due to a process of building trust and relations with their neighborhood which, to their eyes, is socially meaningful and significant. And to conclude that understanding homeless settlement cannot be only explained by the break of social networks. The symmetrical processes of “desocialization -resocialization” need to be taken into account. We are therefore facing a dilemma: Should such situations justify a position from local decision makers to give up their responsibility on the ground that you cannot force homeless people to be less vulnerable when they refuse to live in a “safe place”? But is this really a dilemma? Or a lack of political willingness? The answer seems to be given by Finland, the only country in Europe where the number of homeless has steadily decreased during the past years (- 18 % between 2009 and 2016) compared to UK (+7% in one year), Germany (+35% in two years) and France (+ 50 % in 11 years) (4). The policy implemented, known as Housing First (5) is above all a principle stating that a dwelling is the foundation on which the rest of life is put back together. To achieve this ambitious target, municipalities bought flats from the private market and built new housing blocks. According to the foundation in charge of “Housing First”, there is ample evidence that this politic is cost effective, when looking at homeless social costs in other countries. Not speaking about human and ethical reasons. By doing so, decision makers in Finland have shown that enlarging urban resilience to homeless people is not a vague theoretical concept. They did it and can be proud of what they achieved. Cities that will not be resilient enough to reconsider the way they should manage homeless people, prioritizing the question of their settlement, will bear a responsibility towards the urban citizen community. Where is this couple gone? Swallowed by the parking car where they hoped to find a refuge? Moved to their new home to build a new life? No, it is still on the mattress, but we do not see it any longer. Intellectually rigorous examination of a multi-valenced challenge. Using photography to access other portals in our human imagination is brilliant. Many thanks for your contribution to the discussion of resilience.